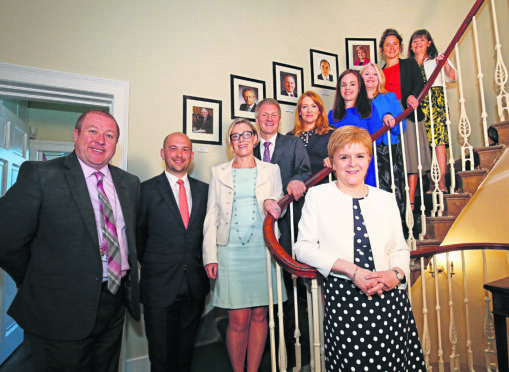 Nicola Sturgeon with the junior ministers, including Gillian Martin. In the last week of the parliamentary term at the end of June, Ms Martin was called to Bute House to be told she would be the new minister for further education, higher education and science. But the next morning The Times published extracts from a blog she had written and posted online in 2007, in which she used derogatory language in reference to transgender people and black people. In the posts, Ms Martin described how she had been told that “American Jews” were known to “tip OK but only if you’ve absolutely busted your hump and everything was faultless in the extreme”. She also said “American Blacks” were “to be avoided” by waiters because they do not tip, and that “the waiters (also black, remember) would do anything to avoid serving a table of blacks or be openly disappointed if allocated one”. Other remarks made by Ms Martin in the 2007 posts made reference to “hairy-knuckled, lipstickwearing, transitional laydees”. Amid uproar at the comments and a move by opposition parties to block her appointment, First Minister Nicola Sturgeon announced that Ms Martin would no longer be nominated for the post – just 24 hours after she was named as the new minister. After two weeks, the Aberdeenshire East MSP broke her silence as she vowed in The Press and Journal to never stop apologising for the “inappropriate” language she used, describing the “shame” she felt when the remarks resurfaced. She also explained that the post about tipping related to her time working in a New Orleans bar when she was 21, and that she was relaying the “stark racial terms” used by her colleagues, because the descriptions “shocked me at the time too”.